Take one look at the Wye Valley in Wales with its picturesque limestone gorges and dense ravine woodlands and you’ll see why it’s a designated Area of Outstanding Natural Beauty. Peaceful and serene, it’s the ideal romantic retreat from the hustle and bustle of everyday life. You’ll find your ideal hideaway in the idyllic Johnson Cottage. Johnson Cottage can be found in the village of Brockweir, on the eastern bank of the River Wye. Whilst the village is actually in Gloucestershire, Wales lies just over the road bridge crossing the Wye. The village lies within the Forest of Dean, one of the surviving ancient woodlands of England. The historic Welsh border towns of Monmouth and Chepstow are a short drive away and the village of Tintern with its famous ruined abbey is a short stroll down the river. Just 20 minutes from the M4, Johnson Cottage is easily accessible from most part of the UK but you certainly won’t feel too close to the hustle and bustle with a babbling brook flowing past your front door. Opening the front door of this two hundred year old cottage, you’ll be greeted by the rustic charm of an open plan living and dining area which has kept all of its original features. The original stone walled fireplace houses a wood burning stove which will be made up ready to go on your first evening. A cosy sofa area close to the fireplace provides all the comfort you’ll need on cooler nights. You’ll also find a TV, DVD and CD player along with a good stack of board games and books. Moving on to the kitchen, you’ll find every appliance you need as well as tea, coffee, milk , sugar, salt, pepper and olive oil to get you started with your cooking. Also provided are washing up liquid and soaps. As a little extra touch you’ll find a wicker basket containing a blanket and picnic set all ready for a sunny lunchtime by the river. Through the French windows you’ll see a courtyard sitting area with pot plants, herbs and hanging baskets, the perfect space to enjoy the first and last rays of sunlight each day. Moving upstairs, Johnson Cottage has two bedrooms which both enjoy a picturesque view over walled gardens and the hills beyond where you can watch rescued horses from a local charity enjoying the open countryside. Spacious and filled with light, the room is complimented by original beams and stone window sills. 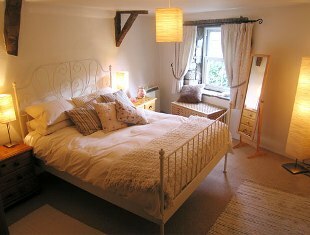 The slightly smaller second bedroom can be made up as one king size bed or two small singles for children. An exposed stone wall and small stone fireplace provide charm and interest to the space. You’ll be sure to get a great night’s sleep as all beds have deliciously soft duck down duvets and Egyptian cotton sheets. A traditional style bath awaits filling with bubbles and fluffy towels, bathrobes and slippers sit close by. What more could you need?